In the early morning, the Prince and Princess of Monaco attended a Solemn Mass in Santa Maria Assunta Cathedral, known as "A Canonica," celebrated by HE Monsignor Olivier de Germay, Bishop of Corsica; HE Monsignor Bernard Barsi, Archbishop of Monaco, HE Monsignor Paolo di Nicolo, Titular Bishop of Mariana, and Jean-Marie Prescelti, Parish Priest of Lucciana, Borgo and L'Alto di Casacconi. The following personalities were present: Alain Rousseau, Prefect of Haute-Corse, Joseph Galletti, Mayor of Lucciana, Paul Giacobbi, Deputy and President of the Executive of the Territorial Collectivity of Corsica, Sauveur Gandolfi-Scheit, Deputy of Haute-Corse, Mayor of Biguglia, Camille de Rocca Serra, Deputy of Corse-du-Sud, Territorial Councillor, and. Georges Marsan, Mayor of Monaco, accompanied by ten Communal Councillors. A delegation of forty pilgrims from the Archdiocese of Monaco also made the trip for this event. The Princely Couple then participated in the procession around the Cathedral of Mariana and its archaeological site before visiting the arts and crafts fair of A Canonica in the late morning. In the afternoon, Their Highnesses went to the Saint-Michel parish church which boasts a fine painting dedicated to Saint Devota. * On 26 September 2009, the Sovereign Prince attended the signing of the Monaco-Lucciana Twinning Oath in the presence of Georges Marsan, Mayor of Monaco, José Galletti, Mayor of Lucciana, and Jean-Luc Nevache, Prefect of Haute-Corse. 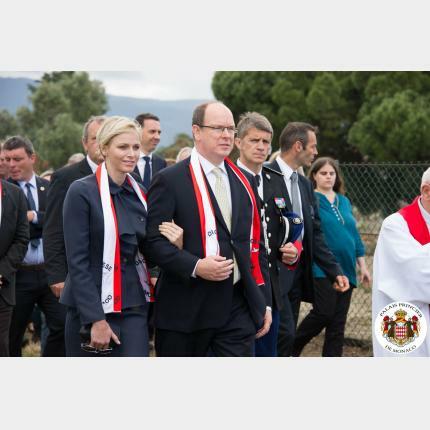 He also went to the site of Mariana to lay the cornerstone for the future Prince Rainier III of Monaco Museographic Centre.